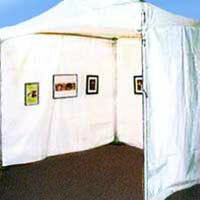 Tent Exterior – tents are 10′ x 10′ x 10′ and are enclosed on 3 sides. Number of walls may differ for corner and group spaces. 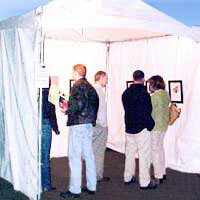 Larger booth spaces are available for group registrations. See the application info for a full list of sizes and prices. Disclaimer – lights and electricty are not available. 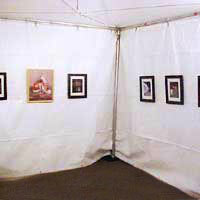 The festival occurs during the long daylight hours of April. We recommend that you remove all artwork at night. The event does provide some security. 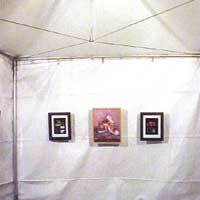 However, the event is on public city streets so it’s best if you do not leave anything in your booth overnight. We provide only the tent. 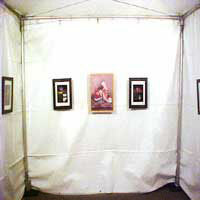 Artists must provide all their own materials to hang their artwork.